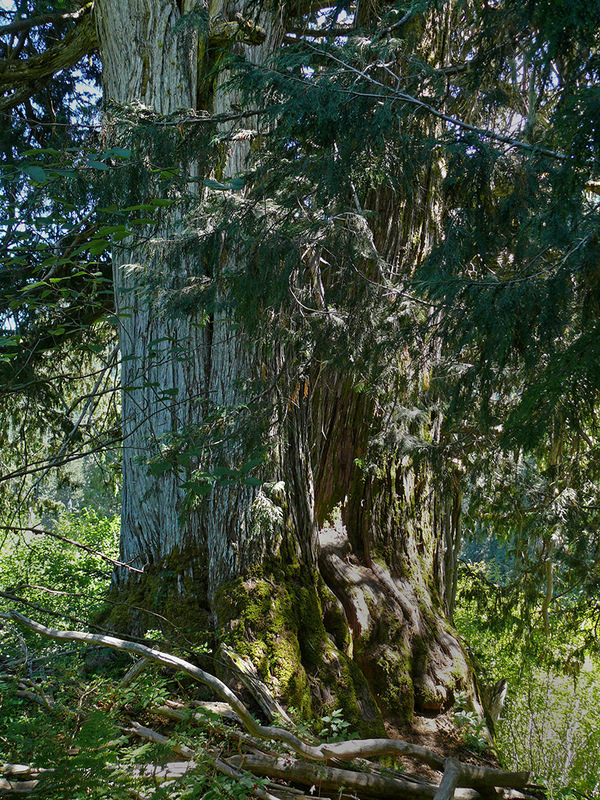 Giant Alaska cedars (Callitropsis nootkatensis) are one of the highlights of this trail. This ancient tree is at least 5′ in diameter! On August 17, Sabine Dutoit and John Koenig joined me for a trip to Echo Basin. I hadn’t been there in 6 years (see Late Bloomers at Echo Basin & Ikenick Creek), and it was another site that John had never been to. It’s a great late summer destination as there are lots of late-blooming flowers, and it stays cool and damp later than many other areas, especially those to the south in Lane County where I spend the majority of my time. It was also nice to take a break from all the bushwhacking and walk on a trail for once, although, on the way back, Sabine commented that all the downed trees across the trail in one area made it only slightly easier than a bushwhack. Since it is a relatively short hike, we took our time getting there, stopping to look at rock ferns (Asplenium trichomanes, Woodsia scopulina, Cheilanthes gracillima, and Cryptogramma acrostichoides) growing in the lava areas along Hwy 126, and to Fish Lake to eat lunch and check out some sedges and asters that John and I had seen as the sun was setting on our way home from Pigeon Prairie the previous week. 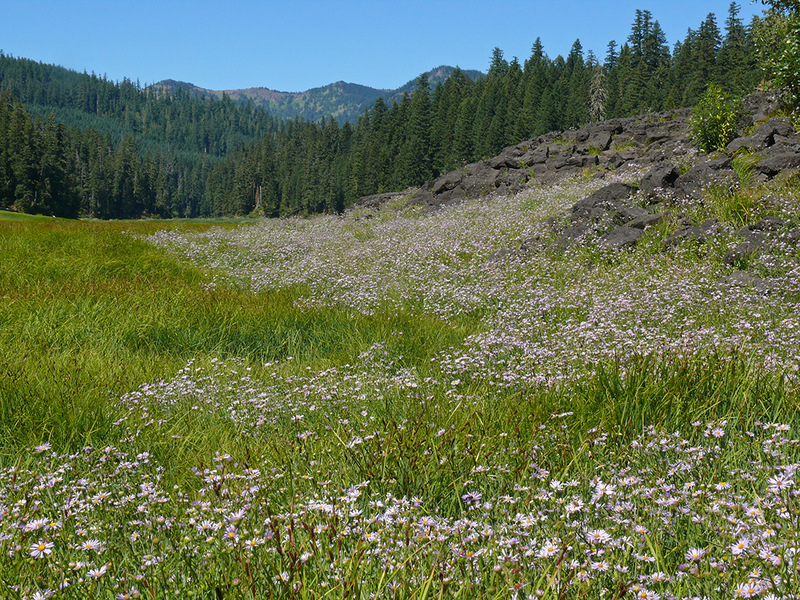 On our way to Echo Basin, we stopped at Fish Lake to admire a show of western asters in the now dried out lake bed. While I didn’t recognize it at the time, the view in the distance is of Echo Peak and the ridge just above Echo Basin. While most of Echo Basin is surrounded by steep slopes, to the east there’s a view of the Hoodoo ski area. Since the day was supposed to be warmer than average, we had gotten the hotter stops out of the way in the morning. Luckily, Echo Basin was even moister and cooler than we expected. 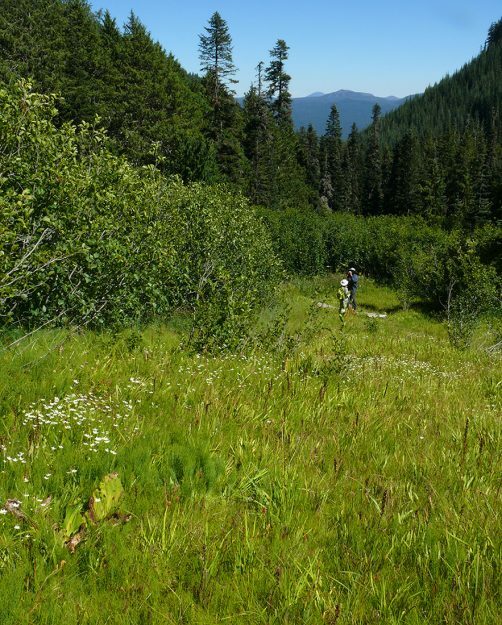 We were surprised at how well the creek was running alongside the trail, and when we reached the wet meadows at the top of the loop on the lollipop-shaped trail, it was actually still quite wet. Even in August, the three short boardwalks were welcomed, and we could have used another one or two to get over still-muddy areas. The Cascade grass-of-Parnassus (Parnassia cirrata) was beautiful. Its bright white flowers were set off by masses of the deep brown heads of straight-leaved rush (Juncus orthophyllus). As we’ve been seeing everywhere lately, hooded ladies’ tresses (Spiranthes romanzoffiana) were also in bloom. Not so showy but also growing in this rather boggy area was a small spikerush that we decided later was beaked spikerush (Eleocharis suksdorfiana). 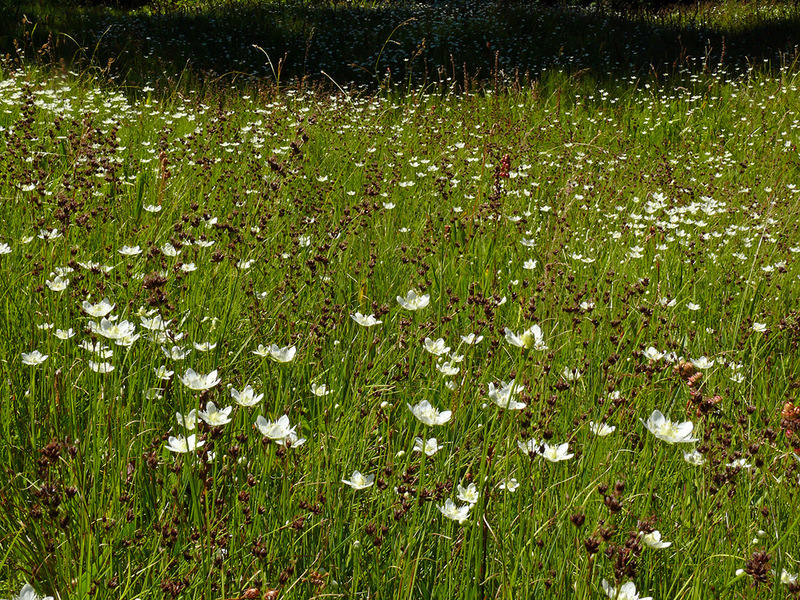 Cascade grass-of-parnassus blooming among the straight-beaked rushes. I keep saying I’m going to learn the spikerushes because there are far fewer of them in the Western Cascades than other genera of graminoids like the closely related sedges. The first thing necessary to learn a group of plants (or animals or whatever) is to figure out what features to look at that help separate the species. One of the important features of spikerushes is their achenes (seed-like fruit). These have a protrusion on the tip of the achene called a tubercle. Often this looks rather like a hat sitting on top of the achene. But in this species, the tip of the achene is elongated with no real defined attachment, more like a pointed hood on a sweatshirt. Few-flowered spikerush (E. quinqueflora) is quite similar and is often lumped with beaked spikerush, but they can be distinguished by their hair-like “perianth bristles” that are attached to the base of the achene. The plants at Echo Basin had bristles much longer than the achenes, while those of few-flowered spikerush are supposed to be about the same length or shorter. Learning graminoids has long sat rather far down on my to-do list, but having John along helps me learn a few new species each outing. That’s the only way to do it, one species at a time! Now I’m looking forward to finding more spikerushes to see if I can make some progress on these. The real treat of the trip was in the middle of the wet slope where there are some creeks hidden under the lush foliage. Here, although the flowers were mostly past peak, there was still a rainbow of colors. 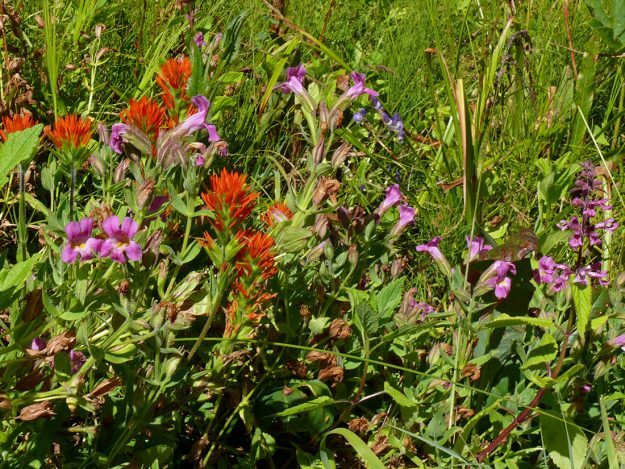 The brightest of them were the scarlet red and lime green Suksdorf’s paintbrush (Castilleja suksdorfii) and pink monkeyflower (Erythranthe [Mimulus] lewisii). While one might find the red and magenta garish together in clothing or decor, in a wet meadow, they look stunning together. Deep blue monkshood (Aconitum columbianum) and lavender western aster (Symphyotrichum spathulatum) complemented them perfectly. A new addition to my plant list was Gairdner’s yampah (Perideridia montana), just starting its flowering season. This white-flowered member of the carrot family was joined by other related late bloomers, including western water hemlock (Cicuta douglasii) and kneeling angelica (Angelica genuflexa). I shouldn’t have waited so long to get back to this wonderful spot and will have to return for the terrific spring bloom, which I haven’t seen for 11 years—just too many great places to go in the Western Cascades! 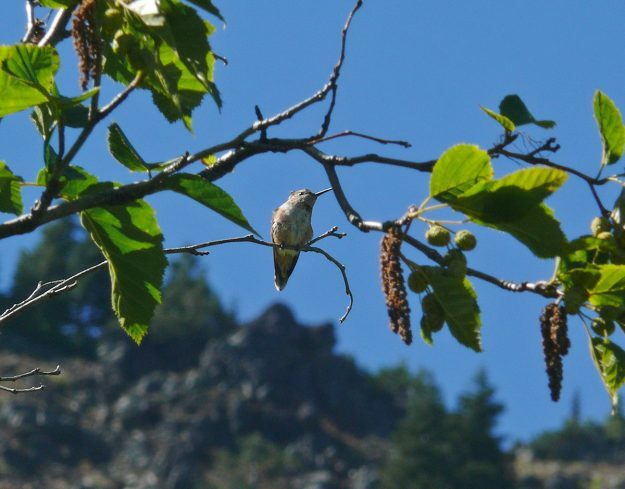 A rufous hummingbird hanging out in a Sitka alder (Alnus viridis). There were a number of them dashing around the magenta Cooley’s hedge-nettle (Stachys cooleyae), a perennial favorite of theirs in late summer wetlands. David Stone wants to do a butterfly trip with Douglas Fir NM, and I was considering suggesting this site, and maybe the approach road. Have you been past the EB trailhead on the road on the south facing hillside? I thought there might be butterflies/flowers there. Maybe butterflies down at Hackleman Creek, down the Old Growth trail? Been there?